Why do we say "Alhumdulilah" after sneezing? Muslim Villa > Forum > Category 10 > Coffee Corner and Kids' Corner ~~~~ > Coffee corner talks with pics - > Why do we say "Alhumdulilah" after sneezing? This is cute, it's beautiful and according to medical science it's one hundred per cent TRUE! Check it out if you have any doubts. 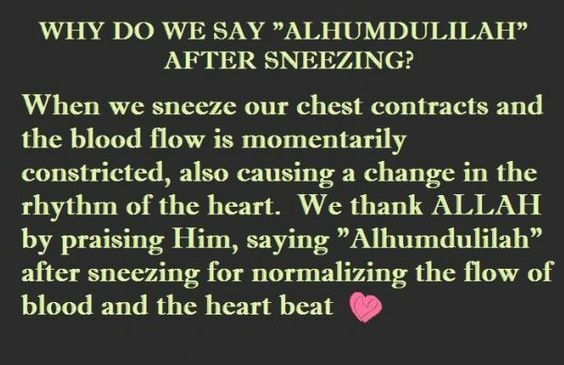 Re: Why do we say "Alhumdulilah" after sneezing? O yes I know it's true Sis. What's not true is the common assumption that the heart stops beating for a second each time we sneeze. The reality behind it is that the chest does contract each time we sneeze which can also be felt as a slight tightening of the chest for a couple of seconds. I certainly do feel that. Contraction of chest obviously narrows the flow of blood which again naturally makes the rhythm of the heart a tad slower. Though very minor and brief, it's certainly a disruption within the body. And the fact that the body tends to be so resilient after this disruption is only by the Grace of Allah, The Greatest. Subhan'Allah. Let our readers sent this around please. As-Salaam Alaikum and Peace to all. Wa'Salam and many thanks sis. You're right, that bit about heart stopping to beat is an urban myth. But contraction of chest, slowing down of blood flow and the heart beat are confirmed facts. The anatomy of every living creature is so intricate that the smallest interruption can mean the end of one's earthly story But it's the will and bounty of Allah that humans get through so many biological hurdles and never even remember to thank Him. However, let's not count ourselves among those thankless one. We're ever grateful to Him for everything; and His kindness is so infinite that we definitely cannot count them however hard we try. Please accept our gratitude, ya Rab. Ameen.